AOR's nanoVAILABLE Boswellia is standardized Boswellia serrata extract, a botanical used in Ayurvedic medicine for support in inflammatory conditions. Boswellia is standardized for boswellic acids, key triterpene phytonutrients, and this standardized extract has been clinically demonstrated to help relieve pain and swelling associated with osteoarthritis of the knee. 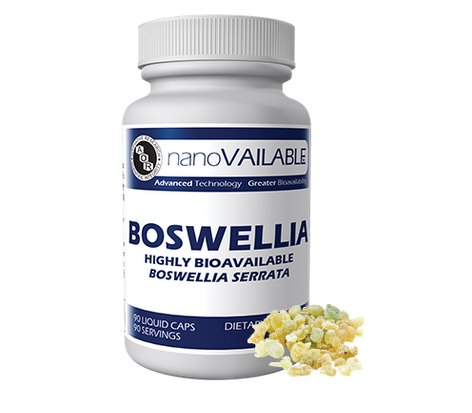 AOR’s nanoVAILABLE Boswellia is formulated with solubilized B. serrata extract in a self-emulsifying formula to maximize bioavailability. Boswellia functions in a similar way as non-steroidal anti-inflammatory drugs that are generally used in inflammatory conditions. However, boswellic acids are less toxic and even more potent. They are effective at blocking the production of pro-inflammatory signaling molecules which cause the constriction of airways in the lungs. One of these signaling molecules is elastase, which may be involved in emphysema and possibly in cystic fibrosis, chronic bronchitis and acute respiratory distress syndrome. Boswellic acids also block the recruitment of inflammatory cells, and the increased permeability of blood vessels, which allow inflammatory cells to reach tissues. Boswellic acids also specifically inhibit the enzyme that is responsible for producing a main category of pro-inflammatory molecules. who can benefit from Boswellia?